The Italian libretto may be accessed online. Ricciardo e Zoraide, premiered in Naples on 3 December 1818, was Rossini’s 26th opera in eight years, and with close predecessor like Il barbiere di Siviglia, Otello, La Cenerentola, La gazza ladra and Mosè in Egitto it goes without saying that it has been rather overshadowed by the competition. This is not to say that it is uninteresting as a story and that the music is undistinguished. It takes place during the Crusades in Dongola in ancient Nubia. The Nubian king Agorante is infatuated with Princess Zoraide, daughter of Ircano, whom Agorante has defeated. Zoraide was captured and the Christian knight Ricciardo, Zoraide’s lover, accompanies an emissary to have her released. Agorante’s wife, Zomira, feels her position as Queen is threatened and arranges that Ricciardo and Zoraide are captured and plots to have them executed. In the end an army of Christians rescues the two lovers. The story is more complicated than the above summary says, but it is something of a thriller and it should be able to engage an audience – as it obviously did at Bad Wildbad in July 2013, even though it was only a concert performance. This on the other hand means that extraneous noises are reduced to a minimum – only applause after some numbers and at the end of acts. The sinfonia is brass-laden and gloomy and we understand that this is going to be a sad story. After 3-4 minutes it becomes lighter in tone, march-like for a while, but there is little joy. Some woodwind for a while lighten things up further but a long horn solo spreads more gloom – though the melody is beautiful. In the end the Rossini we know steps forward, faintly smiling, but no crescendo within eyesight, just a jolly piccolo flute … and then: Curtain! There is a brassy intro to the opening chorus with troops and Nubian people – and here some joy creeps in: their leader Agorante has just returned home victorious. Agorante addresses the people and informs that he has expelled Ircano and his followers because Ircano has denied him the hand of his daughter who, we already know from the summary, happens to be in love with Ricciardo. Thus we are at once involved in the love triangle that is the core of the story. Agorante then sings a cavatina with high-lying tessitura and virtuoso passages, well-sung by Randall Bills who ends in the bass register. The cabaletta that follows, requires him to climb up in the stratosphere. A man of power he is properly hailed by his soldiers … and the audience. Enter Zoraide, who is an important character – at the premiere she was sung by Isabella Colbran and we can expect some great things, but she is not quite in focus yet. After some dialogue with her confidante Elmira, the Queen, Zomira arrives. She offers to help Zoraide deal with Agorante’s unwelcome wooing – but her prime aim is to render Zoraide harmless since she believes Zoraide wants to force her off the throne. Zoraide doesn’t trust the Queen and the two women sing a dramatic duet, where the Queen is formidable in her anger (CD 1 tr. 8-10). When Agorante pops up this gives Rossini an opportunity to write a lively and dramatic terzetto, Cruda sorte! (CD 1 tr. 12-13), with a bridal chorus singing a wedding song in the background (the King is very sure he will bring home his new bride! ), and here Rossini can’t avoid building up one of his famous crescendos. There is a change of scenes, and after a proud soldiers’ chorus we finally encounter Ricciardo and his friend Ernesto. They have just arrived on a ship, Ernesto is there to plead to Agorante that he releases Zoraide and Ricciardo, disguised as an African, is acting as his guide. He sings a cavatina where he pours out his longing after Zoraide. Maxim Mironov, certainly one of today’s best bel canto tenors, has a sappy voice, elegant vocalism and marvellous phrasing (CD 1 tr. 16). In the cabaletta, which is filled with stunning coloratura, Ernesto also joins in. After a new change of scenes we meet the jealous Zomira and her confidante Elmira, who is ordered to keep an eye on Zoraide’s every move. In the final scene the tension builds up and Agorante’s decision to start another war creates turmoil, accompanied by martial rumble from the timpani. We needn’t go into every complication during the second act, but there are some good musical numbers worth pointing out. The first is the duet between Agorante and Ricciardo, the latter still in disguise. Their voices are so different in character that there is no problem to tell them apart. They sing well together, and in the following florid cabaletta Agorante (Bills) excels in brilliant top notes, whereas Ricciardo (Mironov) displays his elegant bel canto (CD 2 tr. 6-7). They separate and now Ricciardo and Zoraide meet alone for the first time – but they are secretly observed by Elmira! Their duet (CD 3 tr. 2-3) is one of the highlights of the score. The final note, taken fortissimo, causes furore in the audience. I would have preferred it much more lyrical. Before Ricciardo has been able to explain his plan to run away with his beloved, Agorante suddenly appears, and when Ircano, Zoraida’s father also unexpectedly appears, this gives room for a quartet, where Nahuel Di Pierro powerful black bass in the role of Ircano gives dramatic depth to the music. In the next scene the vengeful Zomira has a big scene (CD 3 tr. 7-8). Musically it is excellent and Silvia Beltrami’s powerful and expressive voice – more contralto than mezzo-soprano – is certainly in phase with the character. A pity that her vibrato sometimes is a bit wider than one could wish, but it is a dramatic highpoint. The final scene begins with plaintive sounds in the orchestra. 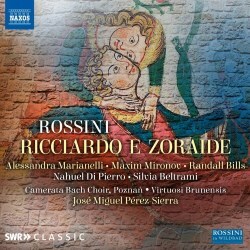 Ricciardo and Zoraide are now certain they will be executed, and Zoraide, expresses her desperation in her grand scena. Alessandra Marianelli musters some really intensive singing here. But their rescue is imminent. Like a deus ex machina Ernesto arrives with his troops and disperses Agorante’s soldiers. He disarms Agorante, but Ricciardo prevents him from killing the King and gives his sword back to him. Moved by such chivalry Ircano grants Ricciardo the hand of Zoraide. Everybody, except Zomira, rejoices at this happy end! Though not one of Rossini’s greatest operas, it still has a lot to offer. The singing on this issue is generally good and Maxim Mironov adds another great achievement to his CV as recording artist. I have previously reviewed him in Rossini’s Otello and Il viaggio a Reims and Bellini’s Bianca e Gernando. The recorded sound is worthy of the occasion, and there is an interesting essay and a comprehensive synopsis. Rossinians shouldn’t miss this opportunity, but should be aware of an alternative recording from Opera Rara, made in 1995 and with a starry cast including Bruce Ford, Della Jones, Alastair Miles, Nelly Miricioiu and William Matteuzzi in the leading roles. I haven’t heard it but my colleague Robert Farr was full of enthusiasm when he reviewed it back in 2005. On its own the present issue will give a lot of pleasure, and it is a great deal cheaper than the Opera Rara.